The Oswego “D” Bus is a family owned and operated shuttle service that has been operating since 2003. We take great pride in being part of the local community and spend a lot of donated time giving back to the community through various events. Such events include: Light Up Oswego, For The Kids (we are also a sponsor) and FallOween. 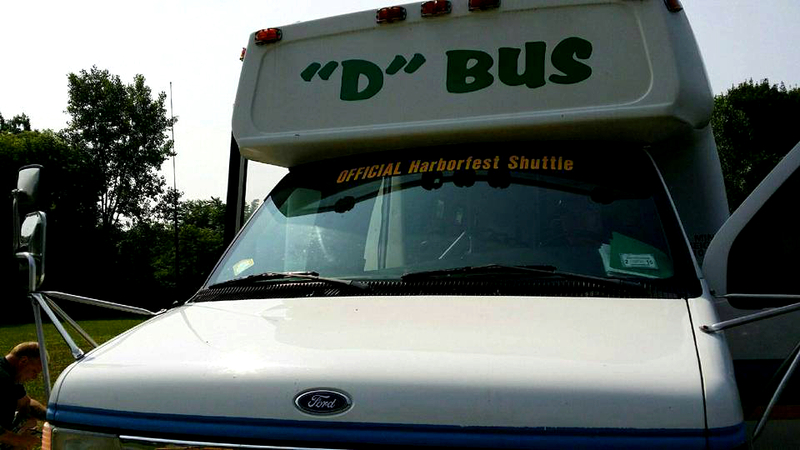 We have also been the Oswego Harborfest Official Shuttle since 2013. The Oswego “D” Bus can charter any event that you have planned from Weddings, Sporting events, a night out on the town and more! Spend the day touring and tasting the wine of the Great State of New York. Along the way, enjoy the beauty of the wine trails as your driver/guide takes you through some of the most unique wine country in New York State. At your convenience is a list of wineries ranging from Canandaigua, Cayuga, Keuka, Seneca, Niagara, and the 1,000 Island wineries. Congratulations on your up and coming wedding!! We know this is a very special day for you and your family. We also know that with all the planning that it can be quite stressful. Let us take away some of that stress for you when you book us as your transportation for your upcoming nuptials. Upon booking us for your wedding, why not make your bachelor and bachelorette party memorable by booking it with us. Looking to have some fun? Here is a unique list of entertainment that is fun for all that we can shuttle your family and friends to.